Taipei, Taiwan—January 30, 2018 — CyberLink Corp. (5203.TW), the world’s leading consumer multimedia software company, is launching its annual “I Love This City” photo contest for 2018. The contest invites everyone with a creative spirit to share their favorite city snaps, turning them into inspiring artwork by using CyberLink’s award-winning PhotoDirector PC software or the PhotoDirector mobile app, for a chance to win a DJI Mavic Pro, a Samsung Galaxy S8, a DJI Osmo Mobile 2 and more. Since it first started in 2016, “I Love This City” has attracted submissions from thousands of creative photographers, sharing beautiful, artistic images of cityscapes from all around the world. In this year’s contest, CyberLink has added new categories for 360º photo editing and “Motion Stills,” allowing users to create and submit stunning Little Planet style photos and cinemagraphs, both of which can be made with PhotoDirector 9. 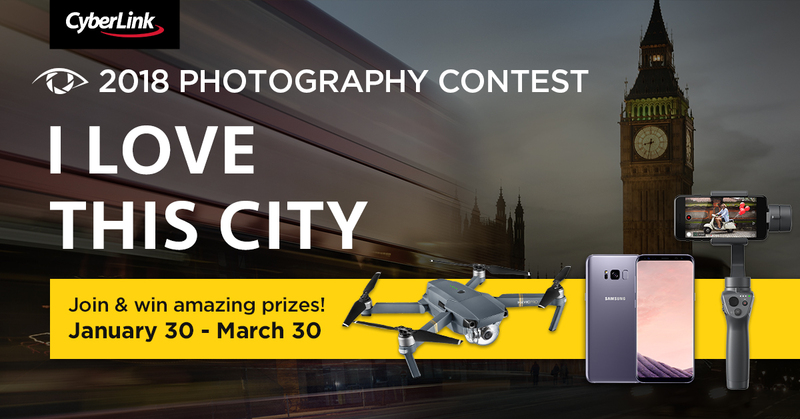 The "2018 I Love This City" contest runs from January 30 through March 30, 2018, with winners announced on April 25, 2018. The contest is open to participants worldwide. Contestants can download a special edition of PhotoDirector (valued at US$49) for free, or use the free-to-download PhotoDirector mobile app. For the complete list of prizes and rules, please visit the “2018 I Love This City” contest website. CyberLink’s PhotoDirector is one of the most popular photo editing products in the world. CyberLink has shipped more than 60 million copies of PhotoDirector to PC and Mac users, and its mobile counterpart has been downloaded more than 50 million times across Android and iOS devices. PhotoDirector has empowered over 100 million users worldwide to push the limits of their creativity and to turn their photos into masterpieces.